Some late model Ford family vehicles come with a great feature called SecuriCode™. 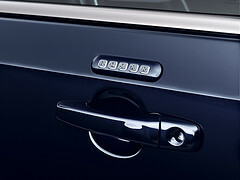 SecuriCode™ is a keypad located on the driver’s door that unlocks the door when the correct code is entered. Newer SecuriCode™ equipped vehicles allow you to retrieve your number using two already programmed keys. Older model cars with keypads can be pulled using a diagnostic computer. We can pull a majority of those with out equipment. Here is a list of the Ford Keyless Entry Keypad Codes we can pull.